They call it the ‘50p seal’ because that’s what it costs in your hand. Unfortunately, fitted to an RS6, it costs considerably more – from around £2200 after you’ve taken parts and labour into account. It goes in the oil pump. When it fails, it allows oil to leak onto the driver’s side of the engine’s undertray. 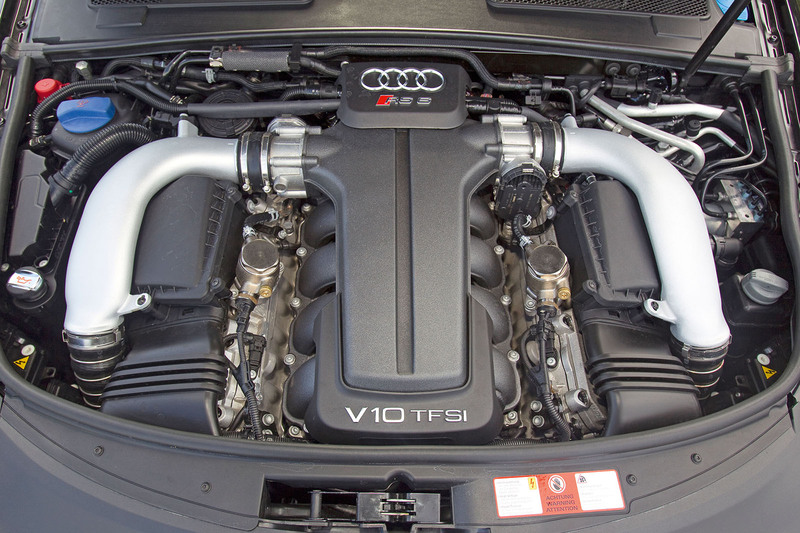 When checking over a used RS6, look for oil pooling there and weeping at the back of the engine. We might as well get that out of the way first. That and the car’s coolant pipes, which, where they run around the wheel arch, are exposed to the elements. In time, they rot and leak fluid. Some garages reckon it’s an engine-out job to fix but others are smarter and can do the work in situ for a fraction of the price. Either way, check these as well before you buy. And while you’re at it, give the dynamic ride control (DRC) system the once-over. Its hydraulic dampers can leak fluid. Road dirt was blamed for damaging the seals and at one point Audi issued rubber covers to protect them. Check for leaks. Performance behemoth sheds two cylinders. 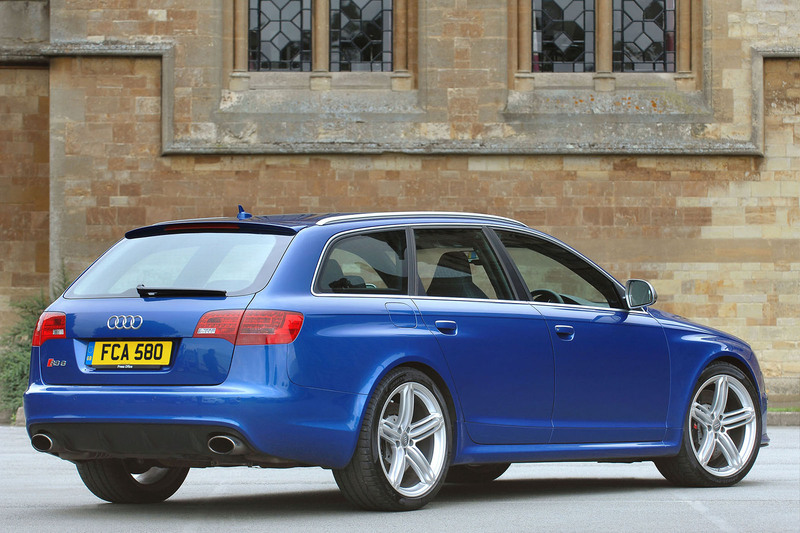 Is that progress for the mighty Audi RS6? The RS6 – the C6-series model that ran for just two years, from 2008 to 2010 (it was mildly facelifted in 2009) – is powered by a 5.0-litre V10. It’s force-fed by an intercooler and two turbochargers to produce 572bhp – and 479lb ft torque from 1500rpm all the way to 6250rpm. Quattro four-wheel drive and a six-speed Tiptronic gearbox (so without the brutal launch control system found on some of Audi’s DSG-based S tronic gearboxes) are standard. Also standard is the aforementioned DRC suspension, a mechanical system that diagonally links the car’s front and rear wheels using hydraulic lines controlled by a central valve. It’s supplemented with a three-stage variable damping system offering three ride settings: Comfort, Dynamic and Sport. Check it all works. The RS6 rides on 20in alloy wheels and weighs a smidgen over 2000kg. The cabin must shoulder some of the blame for the car’s scale-crushing portliness. Climate control, a Bose sound system, electric front sports seats, heated front and rear seats, leather trim – you name it. Options included privacy glass, rear sunblinds and soft-close doors. A lot of RS6s have these and more. They also have a penchant for the hard stuff (expect around 17mpg) and an annual road tax bill of £535. No one said supercar-crushing performance was cheap. 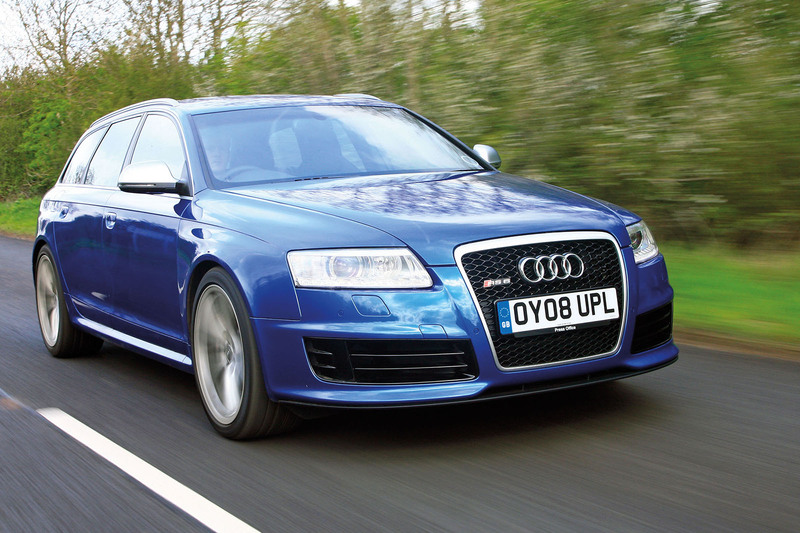 Actually, when you consider prices for 2008-reg RS6s start at around £17,500, you could say exactly that. Check the suspension and the coolant system are sound, make sure you’ve got 50 pence in your back pocket for that oil pump seal, and have a go. ENGINE - Oil changes are every 10,000 miles. Audi reckons the major service is every 60,000 but every 20,000 is recommended. Beware the dreaded ‘50p seal’ (see main story). The engine can take a Stage 1 or 2 power boost to 850bhp without strengthening but check the work has been done by a recognised workshop. COOLANT SYSTEM - Where the coolant pipes run behind the driver’s side wing, they’re exposed to the elements and rust through as a consequence. Some garages claim it’s an expensive engine-out repair but it can be done in situ for around £500. SUSPENSION AND BRAKES - Standard hydraulic dynamic ride control (DRC) suspension can suffer leaky shock absorbers. Budget around £600 per corner for parts and labour. Check the suspension hoses linking the system diagonally corner to corner aren’t leaking too. Huge 390mm front brake discs are around £550 each, including pads. Check tyre life since premium rubber is about £250 a wheel. BODY - Corrosion is unknown, so if you see any, suspect a crash repair. On that subject, check for uneven panel gaps. INTERIOR - It’s tough but check everything works, including the DRC’s three settings. Audi will sell you a warranty for your RS6 if it has done less than 100k miles and is unmodified, so buy a high-miler and beat the seller down to recover the warranty cost. As an example, named component cover on one 99,000-mile 2008/08 RS6 Avant with full Audi history is £1514 with a £250 excess. The car’s for sale at £21,000 but its trade value is £16,150 so, depending what it owes the dealer, you could haggle the warranty cost off the price. £17,500-£19,995 - The first 2008-reg RS6 Avants, and the odd 2009, from 90k to 120k miles. £20,000-£22,995 - More tidy 2008 and 2009 Avants with around 80k miles, such as a 2008/08 with 73k miles, full Audi service history and an AA warranty for £22,995. £23,000-£24,995 - Ditto above but 2009-reg saloons with around 70k miles now in the mix, priced from £24,000. £25,000-£29,995 - Mainly 2009-reg Avants with less than 50k miles plus some saloons, including a 39k-mile 2010-reg for £29,995. 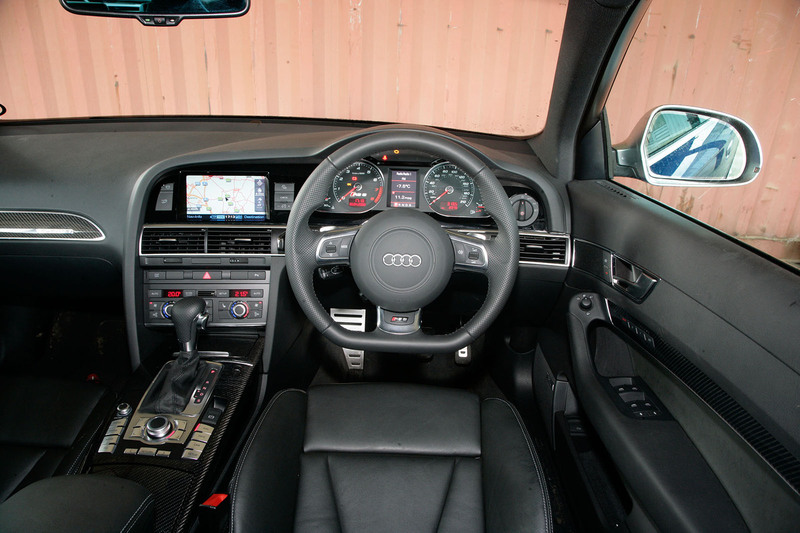 AUDI RS6 AVANT, 2008/08, 73K MILES, £22,000 One-owner RS6 with full Audi service history and black leather interior. Its auction value is around £17,750 so there’s surely scope for a discount. But given its rare and prized one-owner provenance, full Audi service history and low mileage, expect to fight for it. If you are going to run an AT of this vintage make sure it has an extremely comprehensive warranty. It might, just might run faultlessly but my experience of a dealership when these things were new tells me you need deep pockets to keep them running. "What's that noise?? Is that a leak? - No, it's from the previous car parked here. I think. Is that a misfire? That sounds like a clunk! Is it down on power since I last drove it? HOW MUCH???" One for the (very) brave... Great car, though. Dont get me wrong they are great cars, but ouch the bills !! Just out of interest size are they and how many miles do you do (£900 a year may not be as expensive as you think for such a big car AWD) , you never know you might get a few tips and recommendations. I'm running an old'ish sports car at the moment and I reckon the trick is to buy a straight honest one privately, with no real corrosion and don't worry about the minor problems, these keep the price down and will give you something to do to make ownership interesting and rewarding. Spend time and money on whatever it takes to get it 95% as quick as possible before you get disillusioned/fed up with constant DIY and garage bills then end up selling it on vowing never to do it again. Then once you've got them running right and all the little bits fixed you'll be surprized how fun it is run/maintain older cars, just remember all the money you spend on repairs is offset by little or no depreiciation.